The main "unibody" 4mm plate is CNC milled out of a solid sheet of premium Lumenier carbon fiber. The outer weave of the carbon fiber runs 100% down each arm of the QAV-X (0/90 weave), maximizing the strength of the carbon and arms. The center layers are offset at 45 degrees providing even and balanced strength throughout the entire plate. Included with the QAV-X CHARPU kit is the popular Lumenier 4Power power distribution board which can be fitted with an optional Pololu voltage drop-down circuit (to 12v or 5v), a XT60 pig-tail. Like the QAV210/180, the QAV-X kit enables mounting of small FPV cameras such as the Lumenier CM-650 in a fully encased assembly which protects the FPV camera during crashes and enables pointing the FPV camera at a wide variety of viewing angles. 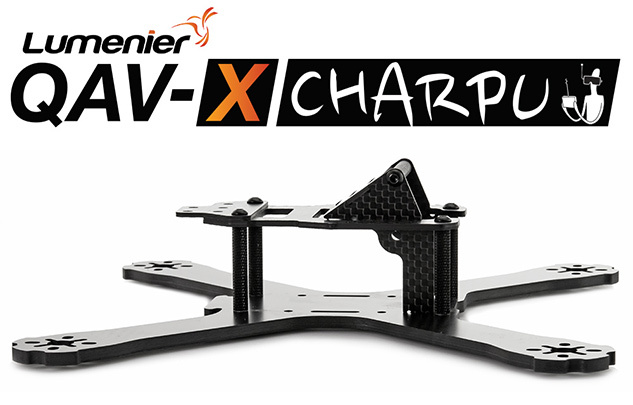 The QAV-X is designed to fit up to 5" propellers and comes in 2 versions. The standard, light-weight version is the 4mm carbon fiber unibody plate, and the 4mm version is for those looking for maximum strength and durability.